Waffles made with brown butter and almond milk. Top with berries, powdered sugar and maple syrup for a perfect breakfast or brunch! In a small saucepan over medium to medium-hight heat, melt the butter and cook, stirring often, until the butter becomes a light brown color, 5-8 minutes. Stir the butter often so it does not stick to the bottom of the pan and burn. Pour into a small bowl and let cool. In a medium bowl, beat together the almond milk, egg yolks, honey and vanilla. Mix in the brown butter. In a separate medium bowl, mix together the dry ingredients. Slowly pour in the almond milk mixture, and mix well. In a separate bowl, beat the egg whites using a hand mixer on low speed until soft peaks form. Carefully fold the egg whites into the batter. 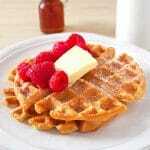 Heat waffle iron until very hot. Coat waffle iron with nonstick spray and carefully pour or spoon (I use a 1/2 cup measuring spoon) batter onto the waffle iron, quickly spreading it to cover the surface. The amount of batter you need will depend on your machine. Cook waffles until golden brown and cooked through. See notes below on how to determine when a waffle is done. Get this recipe for Brown Butter Almond Milk Waffles at https://www.theworktop.com/breakfast-brunch-recipes/brown-butter-almond-milk-waffles/.